Many people have asked me to describe the basis or sources that assisted me in creating the 6 dimensional model of wellness. Since my undergraduate college, Mount Union College, reported in their alumni publication that I had died last October, I should probably write down some of this while I am still alive. When a cousin living in Florida called our house to find out about my death, I asked my wife if I had died and she forgot to tell me. She quickly responded, "Bill, if you had died in October, the garage would be clean!" While it would be tempting to claim "natural creative genius" as the origin of the now familiar hexagonal model, nothing could be further from the truth. Humans have always focused their time and writings on the six dimensions. My undergraduate explorations, through a minor in religion and philosophy at Mount Union College, gave me ample opportunity to explore the rich ideas of famous philosophers. It was Goethe who said, "There aren't any new ideas, we just have to rethink the old ones." If you read the original works of Luther Halsey Gulich, MD, and Brian Furnass, MD, you will find descriptions of the dimensions of wellness and the idea of a merged "holistic" evolution of the mature human. More on Gulich below. Certainly the works of Maslow, Selye, Allen, Robbins, Travis, Ardell, and Furnass added to my clarity in understanding the synthesis of the 6 dimensions. I wanted to emphasize the multidimensional quality of human growth and development, without overwhelming people with too many divisions. Gulich made this very simple when he created the now famous YMCA Triangle - BODY, MIND and SPIRIT. James Albertson, who was a president of the University of Wisconsin-Stevens Point before my arrival had also written about the important dimensions of being human. He also had the belief that a university should not only teach the academic offerings, but should also help people learn how to live their lives successfully. I have attached a convocation address written by Dr. Albertson in 1964. The model of wellness I had envisioned was one designed for humans, focused on behavioral choices people could make to enhance their useful longevity. Even though there are hundreds of programs thoughout the world who have copied my original hexagonal model, many more have added their own modifications or subtracted elements from the hexagonal model. Some people (me included) have actually argued and debated as to which model is the best. My long time friend and colleague Robert F. Allen appropriately chastised such foolishness by reminding us all that the "TRULY BEST MODEL" is the "ONE YOU ACTUALLY USE"
One of the common modifications to my original hexagonal model is a seven dimensional model in which the environmental focus, which was always part of the social dimension, has been added to the original six as a separate dimension. 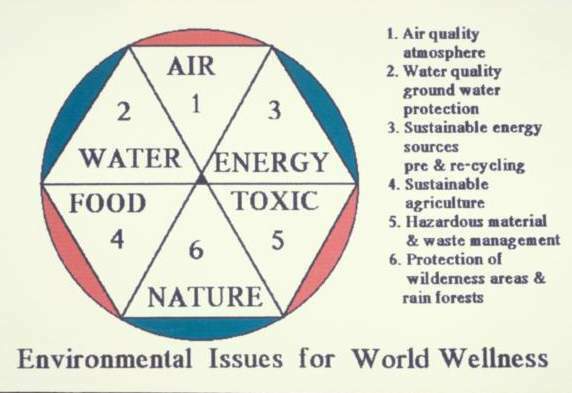 Years ago, I proposed that the environment is so important to the survival of all species that we should really create a six dimensional model focused on the environmental wellness of the planet. At this time in the evolution of this planet there is substantial evidence that humans may be destroying the very environment that is necessary for human survival. 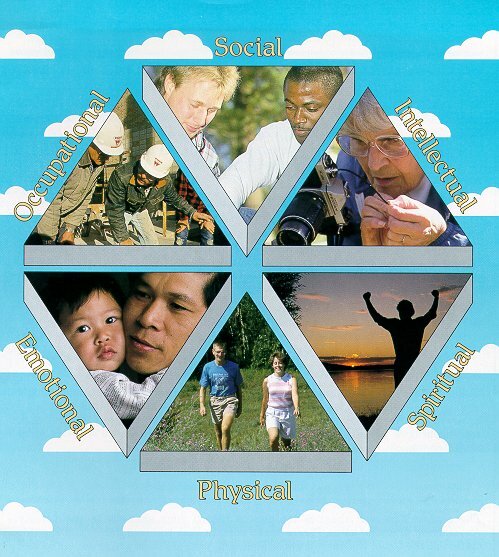 The following graphic was created to show the six dimensions of environmental wellness, the wellness of the world. GULICH MATERIAL, below this point. Luther Halsey Gulick , 1865-1918, American pioneer in physical education, b. Honolulu, of American missionary parents. He studied at Oberlin College, Sargent School of Physical Training (now part of Boston Univ. ), and the New York Univ. medical college (M.D., 1889). From 1887 to 1903 he was secretary of the physical training department of the YMCA. He devised the emblem of the organization and, with James Naismith, originated the game of basketball. He was director of physical training in the New York City public schools from 1903 to 1908; in 1907 he founded the child hygiene department of the Russell Sage Foundation, directing it until his retirement in 1913. With others he founded (1910) the Camp Fire Girls movement. He devoted much of his time to associations interested in hygiene and physical education, wrote several books in these fields, and lectured extensively. In 1917 he surveyed the work of the YMCA in France, returning to write his last and best-known book, The Dynamic of Manhood (1917). Bibliography: See biography by E. J. Dorgan (1934, repr. 1973).